Whether you're an experienced diver or wanting to try a dive and experience the underwater world for the very first time, the Great Barrier Reef makes for the perfect playground. There are a wide range of dive sites rich in fish life and corals that are perfect for beginner divers. With many sheltered, protected spots, its a great place to learn to scuba dive and explore the diversity of marine life. The majority of reef day tours from Cairns offer the opportunity to dive, no experience is necessary as you will be fully briefed and guided by a highly qualified dive instructor. 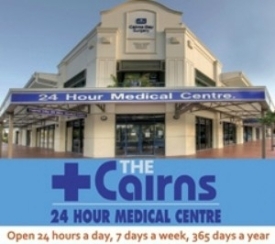 For experienced divers, Cairns is the place to base yourself, having close proximity to an awesome range of dive sites. 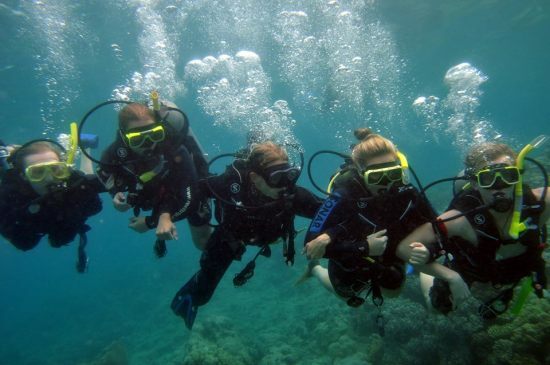 If you've never tried scuba diving before, then an introductory dive is the best place to start. Introductory diving is open to everyone over the age of 12 years who passes a dive medical questionnaire. The dive medical questionnaire simply ensures that you have no medical condition that may put you at risk such as asthma, epilepsy, heart conditions or certain prescribed medications. If you do have a pre-existing medical condition then it is recommended that you complete a dive medical in compliance with Australian Standards AS4005.1 prior to booking your trip. 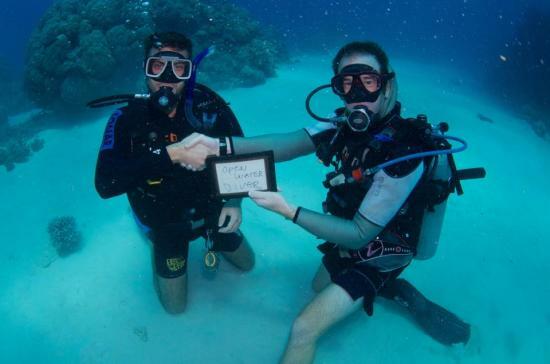 On the day your qualified dive instructor will be with you throughout the whole experience. During the journey to the reef you will be required to listen to a diver briefing which will cover the use of equipment, hand signals, safety and skills. On arrival at the reef you will then be provided with a wetsuit or lycra suit and assisted with putting on your scuba gear. Once in the water your instructor will assist you with practicing with your equipment on the surface, then when comfortable you will practice the skills again about 1m below the surface. Once everyone has become familar to the new surrounds and comfortable with breathing underwater it is then time to dive! Your instructor will be by your side at all times with a maximum of 4 divers per group. The maximum depth you can go to on an introductory dive is 12m, however most of the dive will be conducted at shallow depths as this is where the good stuff can be found. Corals love the sunlight and are much more colourful closer to the surface. The dive usually lasts around 20-30 minutes and at the end you will be rewarded with a souvenir dive certificate as a memento to one of the best experiences of your life! The Great Barrier Reef is one of the world’s most iconic destinations for travellers and certainly at the top of the bucketlist for any dive enthusiast. 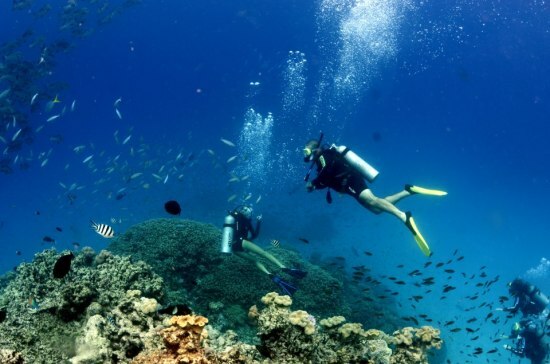 The majority of reef trips offer the option to scuba dive, there are also some reef operators that specialise in scuba diving, offering up to 3 certified dives in a day. Some reef operators have access to exclusive moorings that are selected on the day based on the weather conditions and visibility. Every dive site has its own attraction and appeal, whether its coral gardens, reef walls, bommies, swim throughs or caves and you will never experience two dives the same as there's always new areas of the reef to explore, and marine life to encounter. If you haven't been diving for a while and would like to improve your skills, then a refreshed course might be worth looking into, so that you can dive with confidence and get the most out of your experience. If you are travelling alone then your dive supervisor will team you up with a buddy of similar experience or if you prefer you can choose to take a guided dive with a qualified Divemaster. An advantage of a guided dive is that the divemaster can show you where all the cool stuff is! Some reef trips include a dive guide, whereas others this is an additional cost. A certified dive lasts approx 40 minutes, you can choose to bring your own gear or top quality serviced scuba equipment will be supplied. Remember to bring your log book and certification card as you will need to present them on the day. 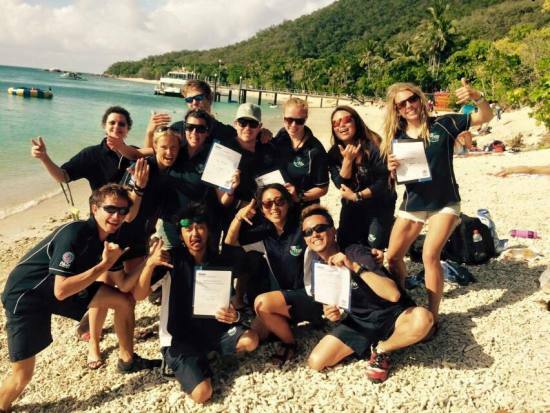 Get your PADI certification on the Great Barrier Reef! 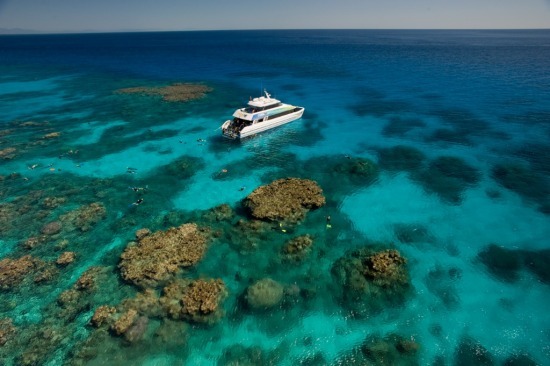 The Great Barrier Reef is the perfect place to learn how to dive, with ideal year round conditions. The water temperature never drops below 22 degrees celsius and the visibility averages between 10 to 30 metres. 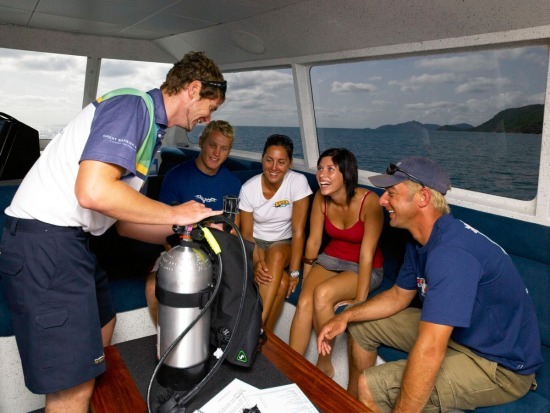 Dive courses in Cairns cater for everyone from beginner through to professional levels. 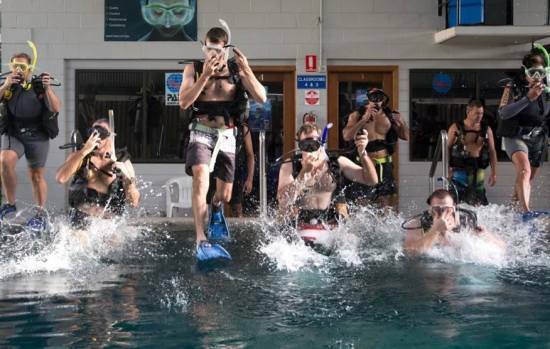 If you're short of time you can complete your PADI Open Water Certification in 4 days with 2 x classroom and pool training days and 2 x day trips to the Great Barrier Reef to complete your open water training dives. 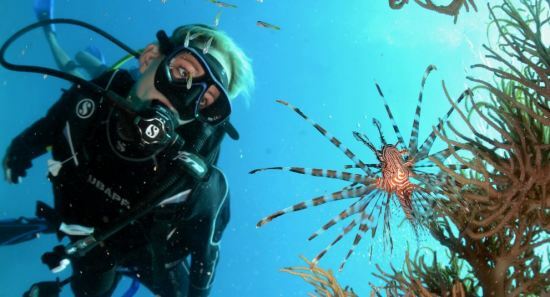 There is also the option of a referral system which allows you to commence your dive education in one place and then complete the final open water dives on the Great Barrier Reef. If you have more time on hand then a liveaboard dive experience provides the best value with 2 x days pool & classroom and 2 nights/3 days of diving with the opportunity to complete up to 9 dives (4 training dives and 5 pleasure dives – inc one night dive). 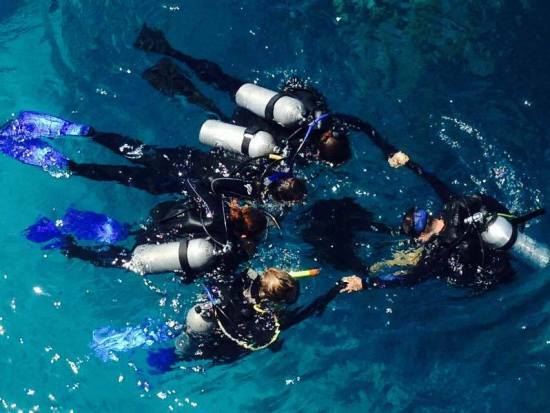 Beyond the PADI Open Water Course is the PADI Advanced Open Water Course. This is an opportunity to tune up your skills and help you become more comfortable in the water. This course can be taken straight after your Open Water Course. If you're wanting to get serious with your diving then the Professional Development Courses are a challenging and rewarding experience that can lead into a career in scuba. 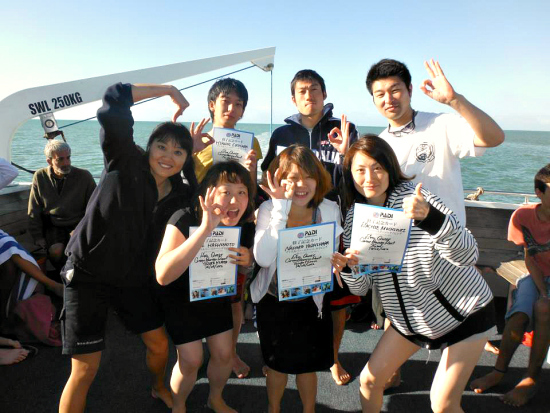 Rescue Diver, Divemaster and Open Water Scuba Instructor courses take place regularly. We recommend that you do not fly until at least midday the day after your dive trip returns. This will give you 24 hours of surface interval after diving. All recreational diving operators in Queensland require that certain types of divers have an AS 4005.1 compliant dive medical carried out before diving. In particular for Open Water dive courses, advanced dive courses, and situations where a diver has indicated in their Medical Questionnaire that they have a medical issue that is contraindicative to diving. Here is a comprehensive list of medical centres where you can get a dive medical assessment to Australian Standards AS4005-1. 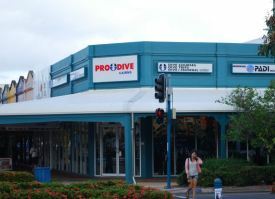 Pro Dive retail store is located on the corner of Shield & Grafton Street, and stocks the largest range of dive and watersport products. We recommend buying a good mask and snorkel. You will appreciate being more comfortable when scuba diving, and a good mask is less likely to let water in. 1. Always dive with a buddy. 2. Plan your dive. You and your buddy should agree on depth, time, air cut-off, and safety stops. 3. Revise your skills regularly. Practise mask-clearing, regulator removal, and air- sharing regularly. 4. Thoroughly prepare and check your gear prior to diving. 5. Always dive within your comfort zone. Choose dives that match your training, experience and confidence. 6. Ensure your dive gear is regularly serviced. 7. Ensure your diver training is conducted by a recognised agency. 8. Some medical conditions are not compatible with safe diving, so ensure you are medically assessed by a doctor who has appropriate training in diving medicine. 9. 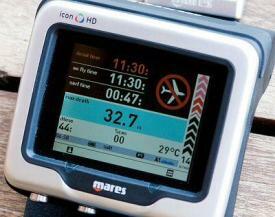 Complete safety stops on all dives that exceed 10m depth. 10. If its been a while since your last dive, take a refresher course and do some easier dives to regain your confidence. 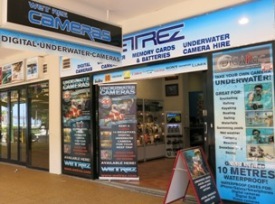 WetRez Underwater Cameras stocks a fantastic range of cameras and accessories as well as offering underwater cameras for hire. Digital underwater cameras deliver greatly superior results to disposable or re-usable film cameras, and for your trip of a lifetime to the Great Barrier Reef you would want to have the best images to remember by. WetRez includes a FREE 4GB SDHC Memory Card with all Underwater Camera Hires so its yours to keep at the end of your trip! !